"He'd make one of those rolls and say, 'No, you can't stop yourself now!' "
Art Blakey. He recieved some piano lessons at school and by seventh grade was playing music full-time, leading a commercial band. 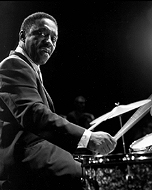 Shortly afterwards he changed to drums, on which he taught himself to play in the aggressive swing style of Chick Webb and Sid Catlett. In autumn 1942 he joined Mary Lou Williams for an engagement at Kelly's Stable in New York. He then played with the Fletcher Henderson Orchestra (1943-44), with which he made a long tour of the South. On leaving Henderson, Blakey briefly led a big band in Boston before joining Billy Eckstine's new band in St. Louis. During his years with Eckstine (1944-47) Blakey became associated with the modern-jazz movement along with his fellow band members Miles Davis, Dexter Gordon, Fats Navarro, and others. When Eckstine disbanded his group in 1947 Blakey organized the Seventeen Messengers, a rehearsal band, and recorded with an octet called the Messengers, the first of his many groups bearing this name. He then traveled in Africa, probably for more than a year, to learn about Islamic culture. In the early 1950's he performed and broadcast with such musicians as Charlie Parker, Davis, and Clifford Brown, and particularly with Horace Silver, his kindred musical spirit of this time. After recording together several times, in 1955 Blakey and Silver formed a cooperative group with Hank Mobley and Kenny Dorham, and Doug Watkins, with the name Jazz Messengers. When Silver left the following year the leadership of this important band passed to Blakey and he was associated with it for the rest of his life. It was the archetypal hard-bop group of the late 1950s, playing a driving, aggressive extension of bop with pronounced blues roots. Over the years the Jazz Messengers served as a springboard for young jazz musicians such as Donald Byrd, Johnny Griffin, Benny Golson, Lee Morgan, Wayne Shorter, Freddie Hubbard, Chuck Mangione, Woody Shaw, Cedar Walton, Joanne Brackeen, and Wynton Marsalis. Blakey was a major figure in modern jazz and an important stylist on his instrument. From his earliest recording sessions with Eckstine, and particularly in his historic sessions with Thelonious Monk in 1947, he exudes power and originality, creating a dark cymbal sound punctuated by frequently loud snare and bass drum accents in triplets or cross-rhythms. His much-imitated [but seldom duplicated] trademarks, the forceful closing of the hi-hat on every second and fourth beat, and the press roll, had been a part of his style since 1950. A loud and domineering drummer, Blakey also listened and responded to his soloists. His contribution to jazz as a discoverer and molder of young talent over four decades is no less significant than his very considerable innovations on his instrument.